Last Spring I turned my backyard into a French-style courtyard. I wanted raised fieldstone garden beds to surround my new outdoor living area. All I needed were a few simple tools, a pallet of cinderblocks and a few bags of Vertical Stamp Mix to bring my vision of an Old World stone flowerbed to life. Figure out where you want the garden beds. 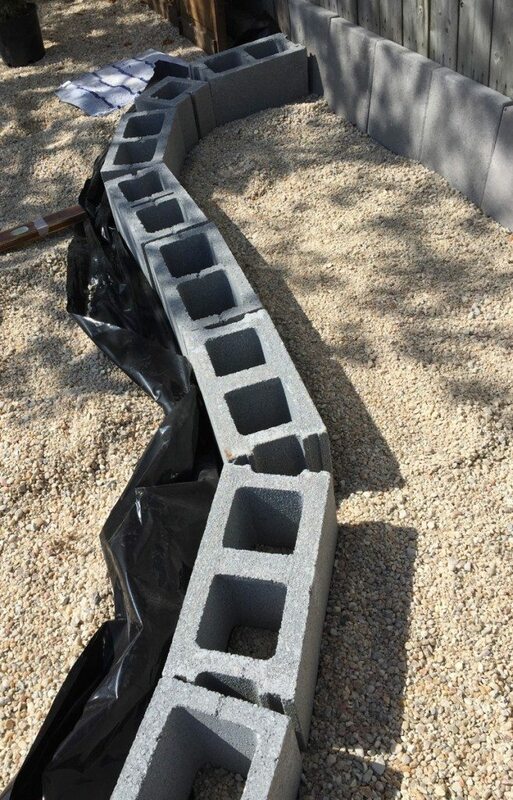 Lay down a 3 mil or heavier plastic liner to collect sculpture debris and protect the ground adjacent to the wall. Place the cinderblocks in the pattern you want. 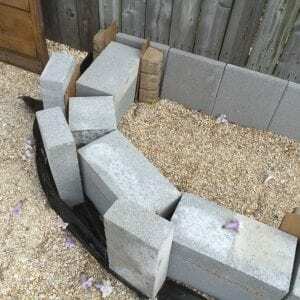 It’s easy to make curves with cinderblocks if you use the 8” X 8” blocks for the tighter curved areas. At this point, don’t worry if there are triangular gaps between cinderblocks where the curves are tight. We’ll address that later. Make sure the blocks are stable on the ground, level, and as close together as possible. 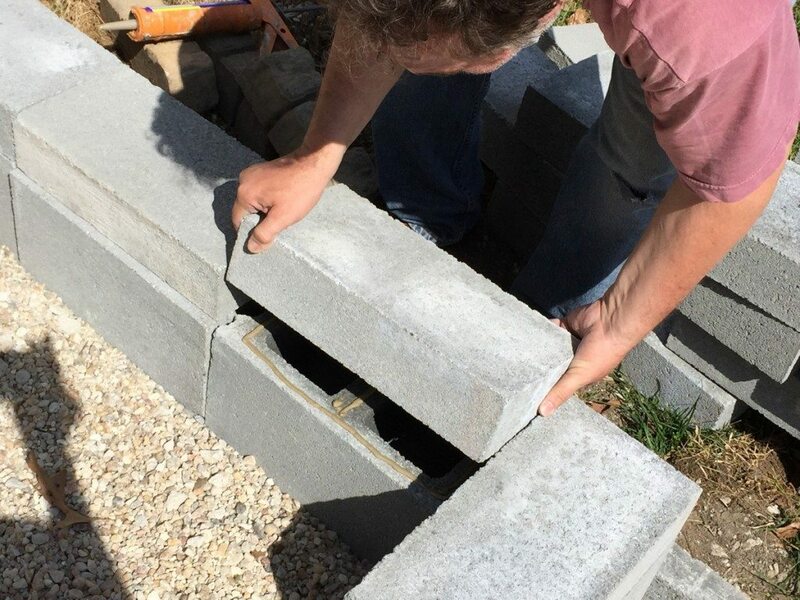 Adhere 16” X 8” solid concrete blocks to the top of the cinderblocks using a construction adhesive. If you’re making a square garden bed, skip this step. If you designed curves, you’ll notice that there are triangular gaps between the straight cinderblocks. I solved this problem by using a piece of cardboard to close the opening of the gap. This space will be filled with mortar. I used a concrete block to keep the cardboard from buckling when the gap is filled with mortar. 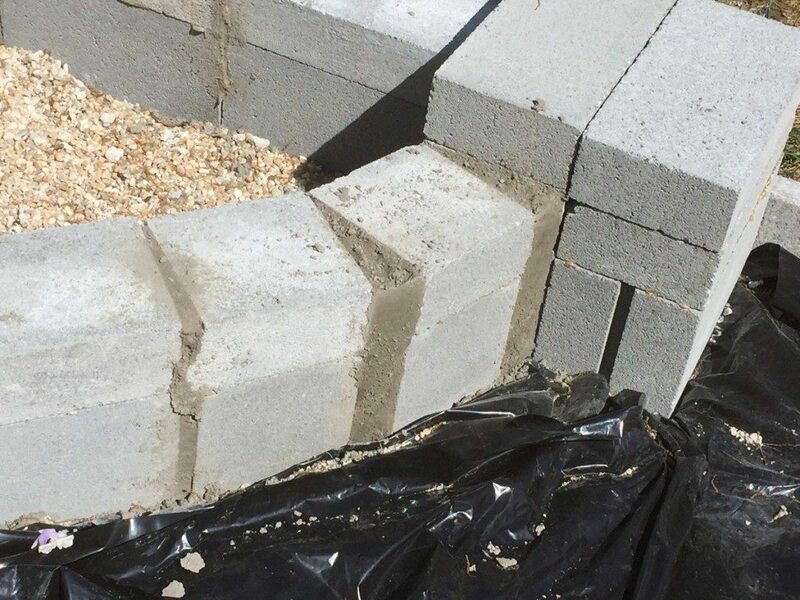 Mix some inexpensive mortar or box store cement and fill the “V” shaped void between cinderblocks. After the mortar has set, remove the cardboard. 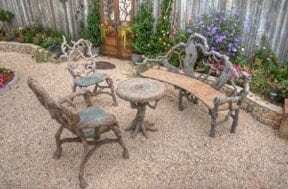 Now you have a true curve in your garden bed as well as a nice surface on which to sculpt. 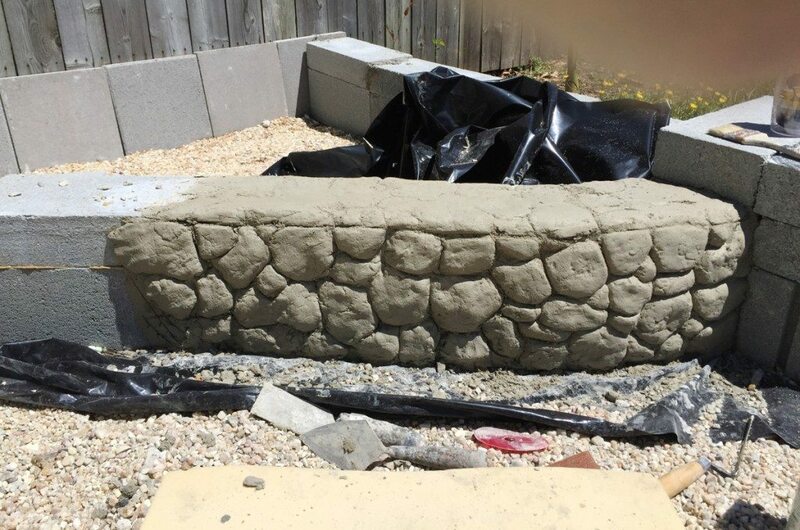 At this point, many would recommend that you put a thin and rough scratch coat on your cinderblocks and let it dry before you use a vertical mix. Personally, I skipped this step, but that’s just me. 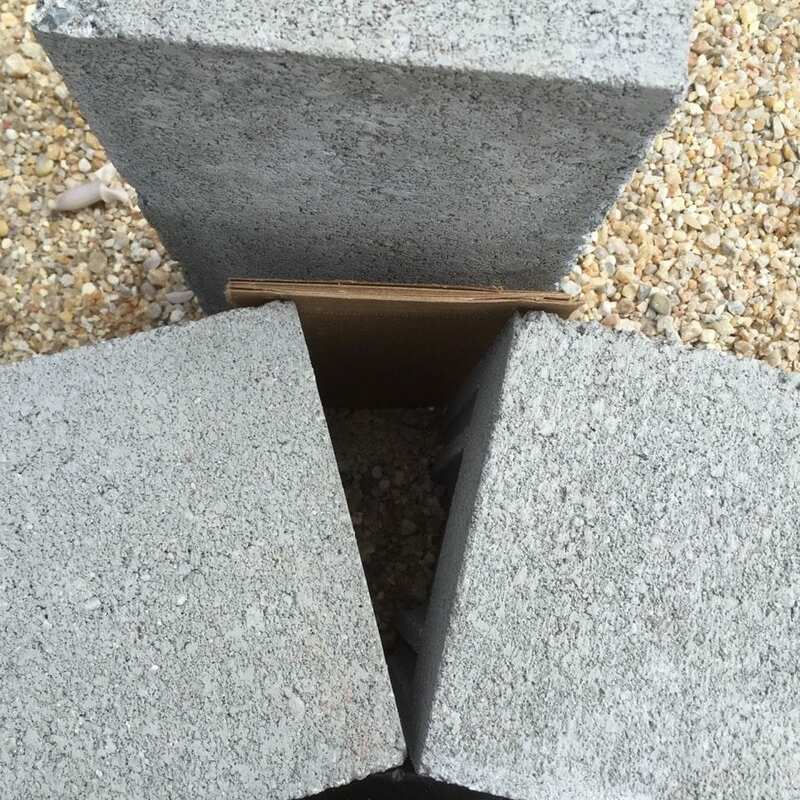 Mix Surecrete’s Vertical Stamp mix according to specifications. It should have a consistency of bread dough. 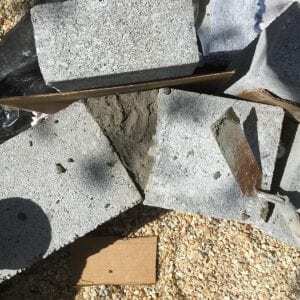 Make sure the cinderblocks are misted with water before placing wet cement on them. You could use a trowel, but often I grab a handful of mix and firmly slap it against the cinderblock until it sticks. I work in 2-foot sections, covering the area with about 1.5 inches of cement. Then I take simple tools such as painter’s palette knives and I begin carving the shapes of rocks. Keep in mind that in nature, fieldstones are random and different sizes and colors. I used a crumpled paper bag to press texture onto the sculpted rocks. I smooth out the final sculpt with a dry chip brush. After you have worked the section, move on to the next 2 ft. section and repeat the process. When the rocks have dried, use Surecrete’s Ecostains to color the rocks. I used a lot of diluted Espresso and Black to get the subtle tone and color variations. Use a sealer to lock in the color and protect your sculpture work from the weather. Finally, it’s time to plant all those flowers and throw a garden party using the thousands of dollars you just saved by using your creativity to sculpt your own fieldstone garden bed. Diane Husson’s website is www.newrelics.com. She is a Norfolk, VA based concrete sculptor specializing in hand sculpted concrete branch (faux bois) furniture and relief tiles and murals. You can also find her at Diane Husson Sculpture on Facebook.